A young Australian band, Alkira unfortunately isn’t the most memorable name you’ll ever hear, which is a shame because the band’s music is well, well above average. 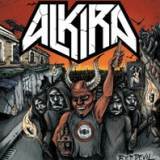 Playing thrash infused with a little groove and sounding something like a cross between old Metallica and modern Exodus with throaty, gruff vocals, Alkira is an immediately impressive band. This isn’t just for the instrumental skills shown off, but also for the songwriting chops, which belong to a band years older. A knack for catchy riffage is shown off immediately with the opening title track, which kicks off with a classic Slayer-esque assault, moving steadily and fitting in an outstanding instrumental section that gives each member a chance to shine – even the bassist. It’s from guitarists Greg Challis and Kyle Simpson that some of the best work comes, the two working together well and trading solos like the best, getting just enough groove into the formula to give the Alkira sound personality. And the following tracks are just as good. Hell’s March is a crunching pounder with fantastic soloing, and The Night Mare slows things down and focuses on the groove with an almightily intense riff. Finale Masks of the World, meanwhile, takes a more technical approach to thrashing, with plenty of guitar pyrotechnics and an end section that speeds up to a gallop and shows the band can be even better when blasting at breakneck speed as grooving it down. Red Devil is only the band’s second release, but it’s one that makes it pretty damn clear that a full-length is required. The band has been supporting big names like Psycroptic, Fear Factory, and Municipal Waste in Australia, and is due a leg-up onto the bigger stage. Here’s hoping we hear much more from Alkira.